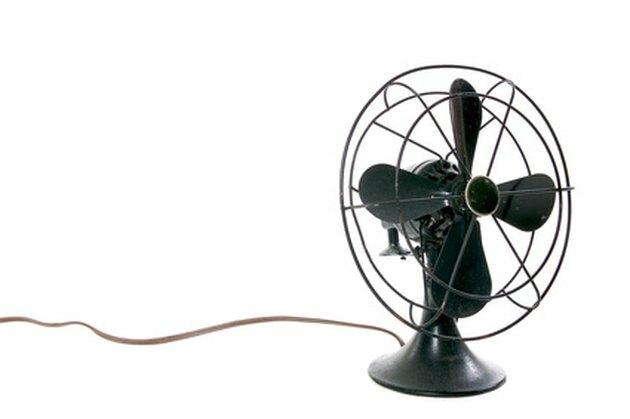 Oscillating fans swivel back and forth, circulating the air in a room and cooling the temperature on hot summer days. The comfort that these fans provide is sometimes canceled out by loud noises that drown out conversations, music and TV programs. These bothersome noises are common, and can usually be eliminated through simple troubleshooting and/or repairs. Oscillating fans make noise for several reasons. Place your fan on a carpeted surface and turn it on. If the fan was noisy on a hard surface, the rattling noise may be due to the surface, not the fan itself. Clean dirt and dust from your fan. Dust and dirt may cause your fan to make noise when running and can also clog up the fan's internal mechanisms. Release the clamps on the fan grill or use a screwdriver to remove the grill. Clean the blades and everything else you can reach with a soft, damp cloth. Use canned air to dust any parts of the fan you can't reach. Replace the grill and run your fan again to see if this has solved the problem. Inspect your fan's parts (fan guards, emblems and housing) to see if there are any loose objects that may be causing a rattling noise. Tighten any loose parts you find. If you can't tighten parts with a screwdriver or wrench, use tape to secure the loose parts. Run your fan again after tightening to see if this has solved the problem. Align your fan blades. Remove the fan's grill and carefully remove the blade hub. Place the hub on a flat surface and measure each blade's height. If there is more than a ¼ inch difference between any of the blade heights, carefully bend the blades to equalize their heights. Replace the blade hub and grill and run your fan again to see if this has solved the problem. Lubricate your motor bearings. Apply two drops of SAE 20 non-detergent oil to each oil port. If your fan doesn't have any oil ports, spray the shaft near the motor housing with lubricant.